Talkgroups are associated with a Customer and may not be shared between Customers. Talkgroups represent individual collections of WAVE Users and Subscribers (radio users). When a user transmits or sends a text message over a Talkgroup, all other users signed in to that Talkgroup receive the audio transmission or text message. Maps are also Talkgroup-specific and show only those users on the selected Talkgroup. Talkgroups may be assigned to WAVE Users, Radio Systems, or both. Talkgroups do not consume a license. More than 16 Talkgroups may be assigned WAVE Users, but WAVE Broadband clients can only activate up to 16 Talkgroups simultaneously. Broadband Users may determine which Talkgroups are active or inactive on their client. 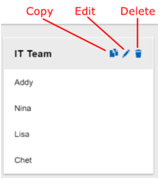 When you mouse-over an existing Talkgroup, the group will change to show the existing Users assigned to that Talkgroup. Additionally, three icons appear at the top right corner of each Talkgroup. User the icons to quickly Copy, Edit, or Delete a Talkgroup.